Book Description: On the Border chronicles a radical political education in a time and place charged with idealism and danger. A Polish Frenchman and a rabbi's son, Michel Warschawski left for Israel at the age of sixteen to to study the Talmud, and eventually became one of the most renowned figures of the Israeli left. Warschawski's involvement in radical politics led to inspiring alliances with Jews, Muslims, Christians, and Marxists. Yet as the border lines hardened, he became targeted by the Shin Bet, Israel's notorious intelligence agents. Finally arrested, incarcerated and interrogated for 20 days, Michel gives his readers an insider's view of the psychological and political pressures that Shin Bet brought to bear, even on Jews, and never lets you forget the severity of treatment that his Palestinian colleagues faced. The book mixes sharp analysis of the ongoing conflict with deep personal insight into the events of the last three decades. The lessons he draws from his experience on the border between Israel and Palestine should be instructive for all the places where cultures rub against each other for better and worse. Warschawski's perspective offers hope for the rich cultural and political exchange that these places offer their inhabitants, and hope for his adopted land. Synopsis: Elegant insider's account of Israeli history and politics Discusses what it's like to live in the middle of the ongoing conflict Beautifully written and already a bestseller in France (10,000 copies sold) Author is a prominent Jewish peace activist and leading French intellectual "This book is not a work by an historian or a study of the Israeli-Arab conflict. Neither is it an autobiography. It is the story of a fascinating and impassioned experience on the border separating States, communities and realities that make up the trauma called the 'Palestinian problem.' This is not the story of a detached observer, claiming objectivity, but rather of an actor, a committed citizen, a militant of the border. While it is factually authentic, it is solely an expression of a personal and subjective view; as such this story is mine and about me." So begins this book. Born into a religious family in Strasberg, Michel Warschawski left for Israel at the age of sixteen to go into Jewish religious orders, and became one of the most well-known figures on the radical Israeli Left. Condemned to twenty months in prison for involvement with illegal Palestinian organisations, his story is one of exceptional and passionate involvement in the politics of the region. In touch with the Jewish diaspora, and inspired by a socialism without borders, the book mixes sharp analysis of the ongoing conflict with deep personal insight into the events of the last three decades. 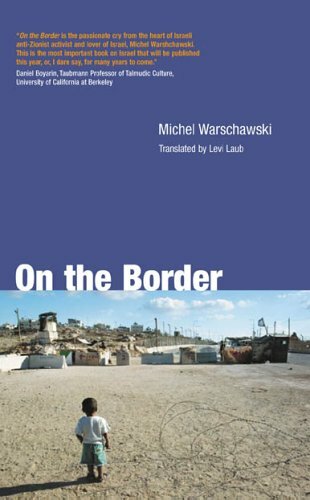 Warschawski explains his moments of despair, his love for Jerusalem, his indignation, his struggles and his hope for the future - that one day the borders, the walls, the checkpoints and the hatred will be brought to an end. I stood to salute our friend one last time. It was the only time that we wept in front of our judges, indifferent to their surprise. We felt distant, very distant from the pathetic questions that the prosecutor tried ot put to me. During one of those innumerable scuffles between Matzpen activists and other students, a smallish, young woman in boots and miniskirt drove off the counter- demonstrators by twirling an impressive bunch of keys attached to a long, thin steel chain, while shouting a string of curses that would make a whole barracks blush. I was fascinated. "What? Youdon't know her? That's Lea Tsemel, a real character." Three years later, after having shared many political adventures, we decided to live together. 1. Yehoshua Ben Zion would be quickly pardoned and freed. A false medical certificate had persuaded Prime Minister Begin that he was dying. Twenty years later the banker was still doing very well.